Emack & Bolio’s: Emack & Bolio’s brings a little piece of Boston to New York City. E&B’s fun rock ‘n roll vibe traces back to its roots when it was founded in the 70s by Bob Rook, a music lawyer who opened his first location as a place for musicians to go to after their shows. The shop serves premium ice cream, yogurt, smoothies, hand-made chocolates, microbrewed sodas, and hand roasted coffee. Emack & Bolio’s makes 100+ flavors each year, and the list of outrageous flavors never disappoints! Chocoholics will love the “Serious Chocolate Addiction,” chocolate mousse ice cream with fudge chunks and chocolate flakes mixed in. 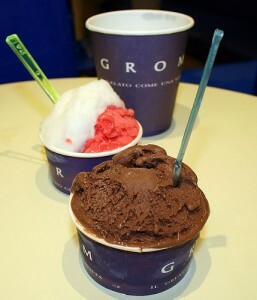 Grom: Try any of Grom’s delicious gelato flavors, and you will swear you can “taste” Italy. Grom uses only fresh seasonal fruit, coming from the best consortia in Italy and Mura Mura (the company’s own 10 hectare farm in Costigliole d’Asti); Lurisia mountain water for the sorbets; and some of the best cocoas and coffees from Central America. Try any of the classic flavors such as Tiramisu, Mandorla (with Pizzuta almonds from Sicily), or Cioccolato fondente (with Venezuelan Ocumare plantation chocolate). Chinatown Ice Cream Factory: The Chinatown Ice Cream Factory has been run by the Seid family since 1978 and stands as a true Chinatown staple. Ice cream, sorbet, ice cream cakes, and cupcakes (new) are served at this local favorite. We recommend the Chinese-inspired flavors such as almond cookie, green tea, lychee, and taro, but the adventurous should try the more exotic flavors like wasabi, coffee brandy, and durian, if you're truly brave. Il Laboratorio del Gelato: Creativity is the m.o. at Il Laboratorio del Gelato, where chefs and caterers are encouraged to develop unique flavors for their individual menus. The shop produces gelato and sorbet, and there are currently about 200 flavors offered. The gelato menu is expansive which is evident by the offering of ten separate chocolate varieties (dark chocolate, milk malt chocolate, Thai chili chocolate, for example) and other seasonal treats. The sorbets are just as delicious with crisp fruit flavors such as Fuji apple, grapefruit hibiscus, and papaya. The Orchard Street location features a café window, and each day there is a rotating assortment of twenty flavors from the menu. Ciao Bella: When a gelato product is known as "America's gelato", you know it's seriously good. 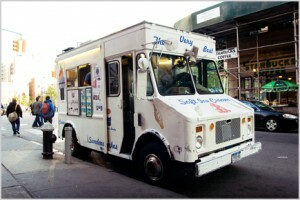 Ciao Bella's was born in Little Italy, where the company has been producing gelatos and sorbets since 1983. Executive Chef Danilo Zecchin is a native Italian who demonstrates the secret to perfection with inspired gelato creations such as honey toasted pecan, chocolate jalapeño and maple ginger snap. The sorbet flavors are fruity and crisp, and favorites include blackberry Cabernet and pomegranate. This entry was posted on Tuesday, August 3rd, 2010 at 8:05 pm	and is filed under Stuff to Do. You can follow any responses to this entry through the RSS 2.0 feed. You can leave a response, or trackback from your own site.